Preheat oven to 205 degrees. In a small bowl, combine melted butter, breadcrumbs, parsley, chives, and cheese. Season to taste with salt and pepper. 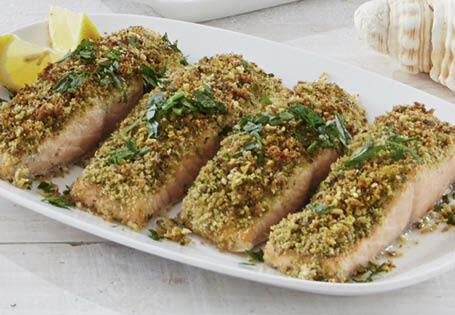 Season salmon with salt and pepper, then spread ½ tablespoon of the mustard over the flesh sides of each fillet. Coat with the breadcrumb and herb mixture. Place salmon, skin-side down, into a lined baking tray. Drizzle with remaining oil and bake for 10-15 minutes until crust is golden and fish is cooked. Serve.